I've fallen in love with soccer, a.k.a. football in most of the world, and am thoroughly enjoying all the matches being broadcast on television. 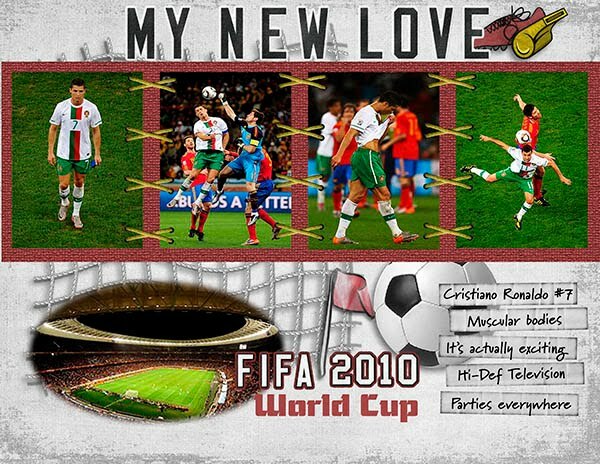 I particularly am keen on Cristiano Ronaldo, #7 on the Portugal team. Oh, if only I was 30 years younger! I was sorry to see them lose their last game and kicked out of the World Cup race. You can see the challenge here. We can choose to copy the layout or the colours or whatever we feel is appropriate for this challenge.